Here’s a gloomy chart from a new Brookings paper. It shows the average wages of men under 50 who lose their jobs in a “mass layoff” event. The red line is for men who are laid off during good economic times. On average, these men have steeply rising earnings in the five years before the layoff and then experience a big earnings plunge. They eventually get back to their old earnings level, but that’s it. Their earnings never again get above that. 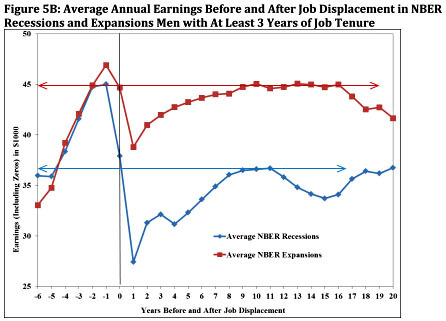 The blue line is for men who are laid off during recessions. They also have steeply rising earnings in the five years before the layoff and then experience a big earnings plunge. However, they never even come close to their old earnings level. They max out at about $36,000 compared to peak earnings before the layoff of $45,000. The steeply rising earnings before the layoff are a little perplexing to me, and I wonder if this is related in any way to the probability of being laid off in the first place. The main takeaway, though, is that if you lose your job during a recession, you are probably screwed for the rest of your life. Even ten years later you’ll earn about 20% less than you did before. This price has been paid needlessly by hundreds of thousands of workers because our political leaders have never had the courage to take action strong enough to get our economy moving again.